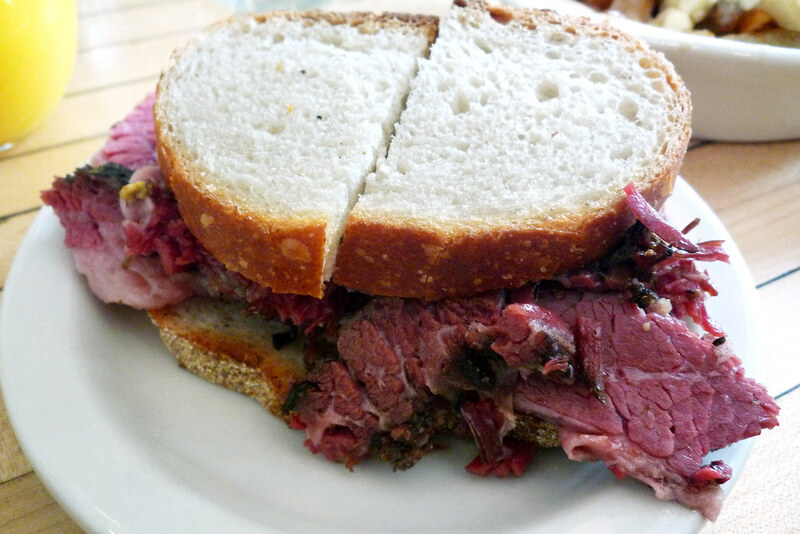 In this solo dining adventure, Gary gets his Montreal Jewish Delicatessen fix without actually going north by visiting Brooklyn’s Mile End. We’re experiencing a bit of a slow influx of Montreal/Québécois food in New York City, which is kinda awesome since the food that’s uniquely them is great. 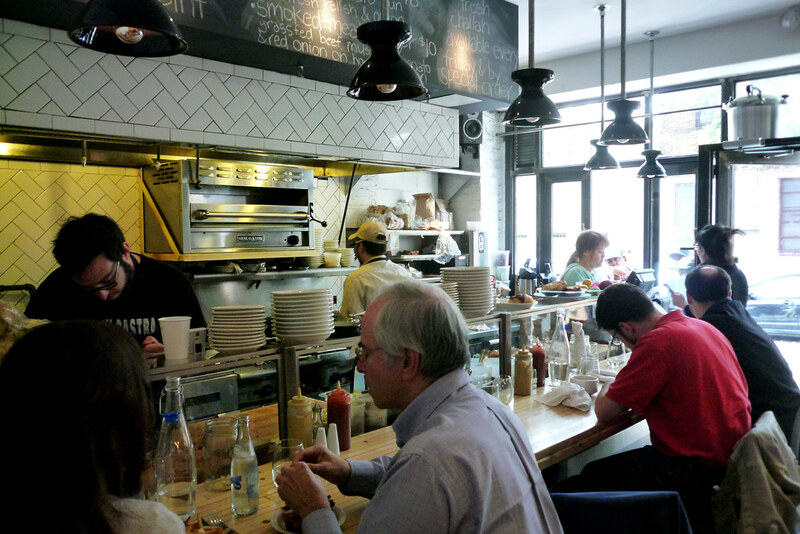 Which is why I was excited when Mile End opened in Brooklyn’s Boerum Hill well over a year ago. So excited that it pains me that it took so long for me to check the place out. How could I have passed up on the smoked meat, poutine, and Montreal bagels all this time when it was a 30-minute subway ride away? Thankfully, I had something of a sneak preview of what they have to offer at their stand at Brooklyn Flea but all that did was leave me wanting more. Finally, a few weekends ago, I made my initial visit along with friends Aaron and Jeremy. Aaron especially was the logical choice to go with since he’s a big fan of all things Montreal though food mostly now since the Expos are long gone but he’s got far more experience with and knowledge of the food than I do. Since the two fellas live north of NYC, that meant we’d only be able to dine here on a weekend. The wait for three seats on a Saturday at noon? Just under an hour. This isn’t a big place after all with five seats at the counter and maybe enough seating at the tables for 20 people. And clearly the place is popular since the number of folks outside waiting to get in was greater than the number of seats inside. We were lucky as some folks in front of us decided the wait was too long and bailed, moving us up on the list so we were inside in less time than quoted. 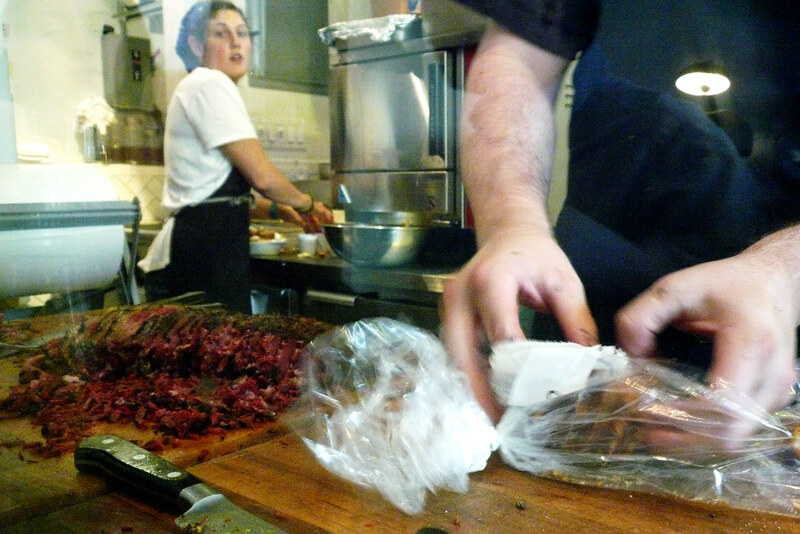 Also, we scored three seats at the counter, giving us a tantalizingly close look at the brisket as it was chopped up and plated. 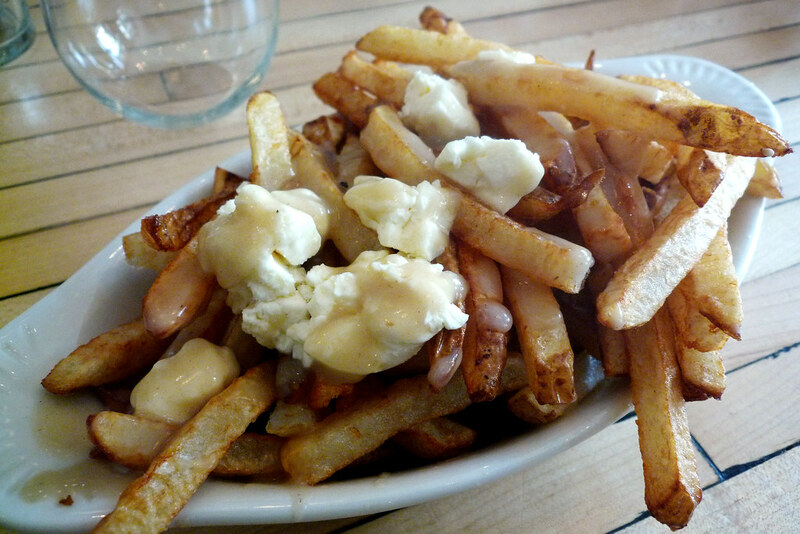 To start, we shared a plate of the poutine which is French fries topped with cheese curds and then smothered in a brown gravy. The fries were really limp and I’m talking about the ones that didn’t get a splash of gravy. I guess it hardly matters since they’d be soggy once they soak up the gravy but I’d imagine it’d be terrible if a regular plate of fries were served at this consistency. But it’s poutine and as far as poutine goes, this was excellent. Big, chewy cheese curds that were fresh though, sadly, not abundant while the gravy was rich but not heavy and definitely flavorful. No complaints about it really with the exception of the soffy fries. With the hungry edge tapered off by snacking on the poutine, it was time to tuck into the real reason to come here – the smoked meat sandwich. It’s seven ounces of beautifully smoked beef brisket with a good balance between lean and marbled. The bread the sandwich comes on is tiny which, along with the meat piled up the way it is, gives the illusion that this is a big sandwich. It’s not big but it’s still a beast of a sandwich. The little bread slices deceives you into thinking that it’s gonna be somewhat light but let me tell ya, this is a lot of meat to down. The meat itself is tender and salty but not overly so and the fat melted just so awesomely in my mouth. The smoked meat sandwich is delicious. Not quite as good as Schwartz’s (the place in Montreal that’s famous for it’s Smoked Meat sandwiches) but definitely worth the trip and able to satisfy a cured meat craving. Jeremy went against the grain and got the special on the menu, an egg dish that included duck sausage. 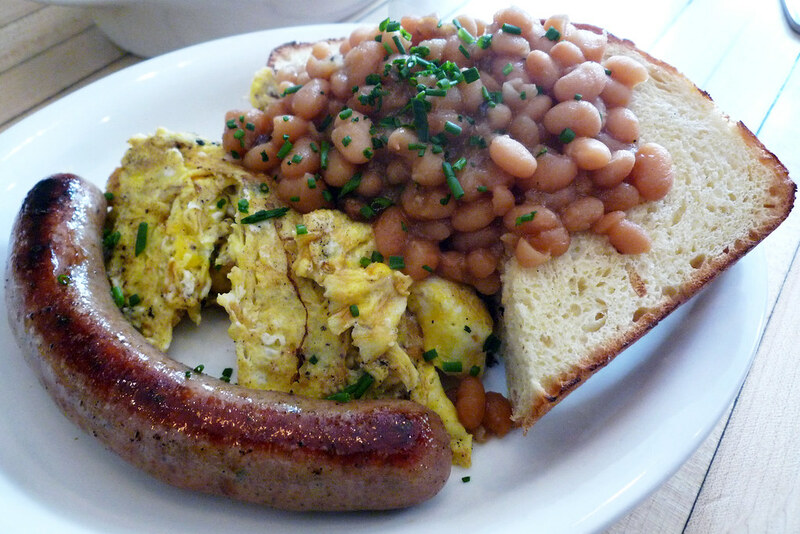 I only had a small bite of the sausage but it was good – slightly softer sausage than the normal pork and it tasted sufficiently duck-ish enough. It’s hard to get a real grasp from the small bite but I’d try it if it were on the menu again. There’s very little not to like about Mile End. 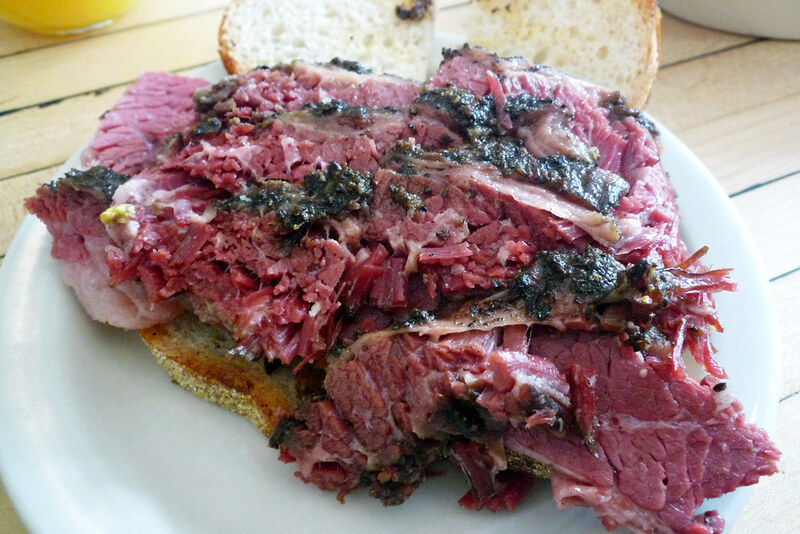 They’ve got the Montreal Jewish Delicatessen thing down cold and they’ve got a legion of fans who show up at their restaurant, not to mention their stands whenever they pop up at an outdoor market like Brooklyn Flea or Hester Street Fair. If anything, the one thing I’d like to see them fix is the damned wait, something they can’t really control unless they expand. Actually, yeah, fix it and move somewhere larger already! Mile End. 97A Hoyt Street, Brooklyn, NY 11217. [Show/Hide Map] (718) 852-7510.
great post as always Gary! this place is dangerously close to BeerMenus headquarters and we love it. did you drink anything interesting with your meal?? @will Uhh, does orange juice count as interesting? Thanks for continuing to read Foodie Call!